Recently, the Czech Post Office issued commemorative stamps for 2010 shanghai world expo officially. 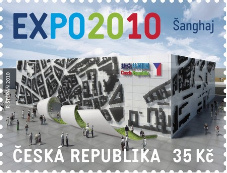 The stamp is designed with shape of Czech Pavilion as the pattern, and on the top of stamp there is a slogan “2010 shanghai world expo” written by Czech. It is said the stamp is worth of 35 CZK (ps: 1 U.S. dollar equals 18.8 CZK). The Czech government confirmed its participation in 2010 shanghai world expo on February 7, 2007 officially, and selected a 2000-square-meters rental pavilion as Czech Pavilion. The Czech Pavilion is a kind of ice hockey made of vulcanite with the whiteouter wall. Ice hockey is a very proud event for the Czech, and the Czech national ice hockey team has obtained great achievements in major international competitions for many times. It is reported that the Czech Republic planned to hold its activities about National Pavilion on May 17. The Czech has a long tradition of issuing commemorative stamps for he World Expo. About 52 years ago, the Czech Republic issued a set of stamps for the first time in 1958 to commemorate the World Expo in Brussels. 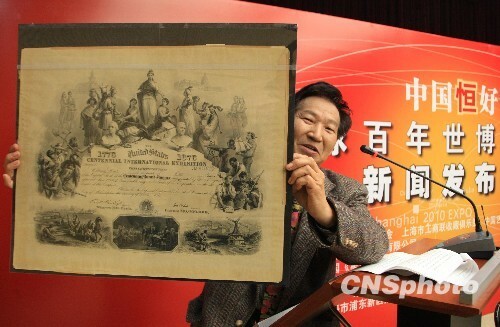 February 23, 1876, the first customized Expo stamp which is issued by the united states for Philadelphia World Expo appeared in Shanghai. Wenan Qiao, vice chairman of Chinese American Collection Association said that the stamp was precious with a pattern of the the Qing officials in the right corner. The apperance of the stamp proves the United States’ high emphasize on participation in 2010 shanghai world expo. 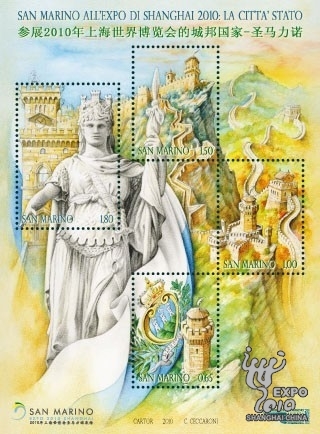 San Marino issued a set of four commemorative stamps dedicated to the Shanghai World Expo, which features the country’s famous Statue of Liberty. The stamps depict the country’s government building, Mount Titano, three towers and China’s Great Wall. The set values at €4.95 (US$6.79). There are a total 600,000 sets of the stamps available for sales at www.aasfn.sm. The world’s smallest and oldest republic issued a stamp “Towards Expo 2010 -Shanghai China” dedicated to the Shanghai World Expo in May. It signed its participation contract with the organizer in July, confirming it will exhibit at a 324-square-meter area inside a joint pavilion for European countries.